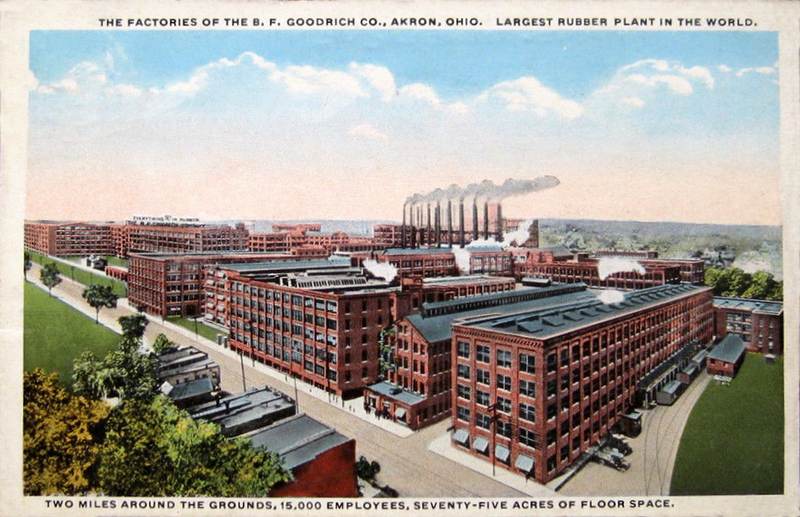 Posted in Factories, Rubber Co.
B. F. Goodrich Rubber Co.
B. F. Goodrich Company, major American manufacturing company of the 20th century, noted for its production of automobile tires and ruber products. In 1869 Dr. Benjamin Franklin Goodrich and his brother-in-law, Harvey W. Tew, purchased the Hudson River Rubber Company, a small business in Hastings-on-Hudson, New York. The following year they accepted an offer of $13,600 from the citizens of Akron, Ohio, to relocate the business there. By the middle of the 20th century, B. F.Goodrich ranked 67th among American corporations in the value of World War II military production contracts. The company went on to become one of the largest tire and rubber manufacturers in the world before being sold to Michelin.